For most applications, three viscosities of composite resin will be needed. Use an unfilled adhesive bonding resin or Ribbond Wetting Resin to wet the fibers (do not use a resin that contains dentin primers or self-etching resins). Use a soft filled composite or Ribbond Securing Composite for adhering the fibers to the etched teeth. Use a flowable composite for covering the over the cured Ribbond to act as a smoothing/covering layer. See our list of compatible composites from major manufacturers. 1 gram tube or as a set of 4 carpules (.25 gram each). 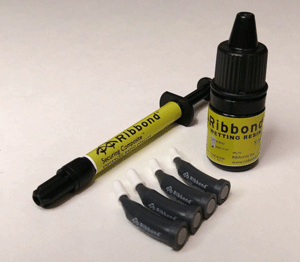 The Ribbond Wetting Resin is packaged in a 5 ml bottle.